Microwave Spaghetti Squash! Spaghetti squash is a great healthy substitute for noodles, but it can be a pain to cook – unless you know how to microwave spaghetti squash! 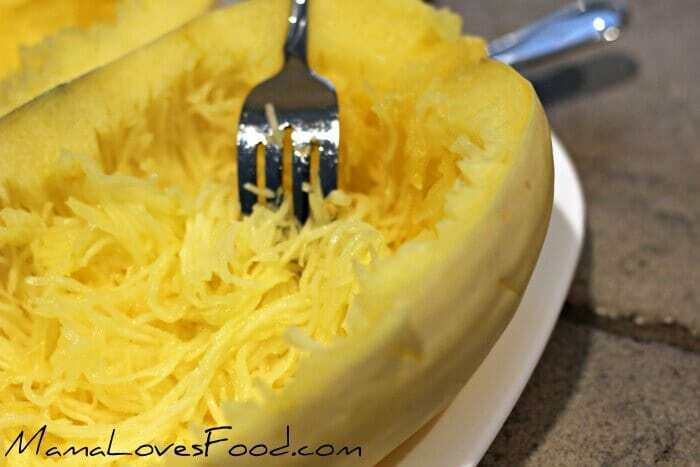 Microwave spaghetti squash is easy to make and super healthy. I love that you can cook it in a microwave with no muss, no fuss, and not heating up your kitchen. Make it a fun microwave food day with our chocolate mug cake, and microwave popcorn in a paper bag! The great thing about making spaghetti squash in the microwave is there is only ONE ingredient. Seriously, just the spaghetti squash! No added oil, or calories at all. When you’ve finished cooking the spaghetti squash you can eat it as is, or add your own flavors. Sometimes I’ll eat my spaghetti squash with just a little butter and salt, but I also love it with mushroom sauce or blender spaghetti sauce! If you didn’t know you could microwave spaghetti squash, you’re definitely mission out! Spaghetti squash is a delicious noodle substitute. Perfect if you’re trying to make some healthy changes, can’t eat grains, or just love spaghetti squash! Most folks cut their spaghetti squash in half before microwaving it, and that works, but it’s definitely not the easiest way. The spaghetti squash has a very tough exterior and is difficult, even dangerous, to cut before it’s cooked. This simple method of microwaving a spaghetti squash whole is the best way to do it! Big thanks to my Aunt Sally for teaching me this method of microwaving a whole spaghetti squash! 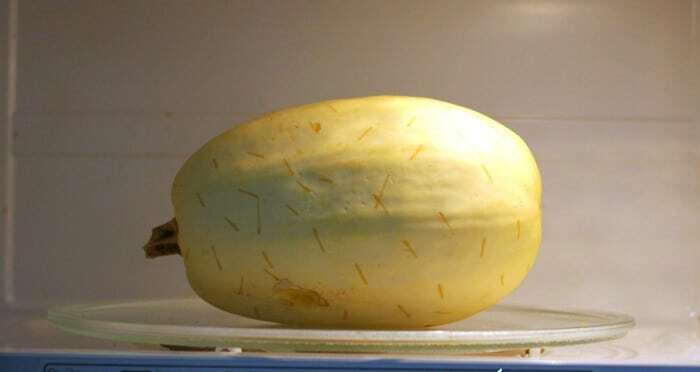 Can you cook a whole spaghetti squash in the microwave? Yes, you absolutely can cook a whole spaghetti squash in the microwave. In fact, it’s the easiest way to cook a spaghetti squash! 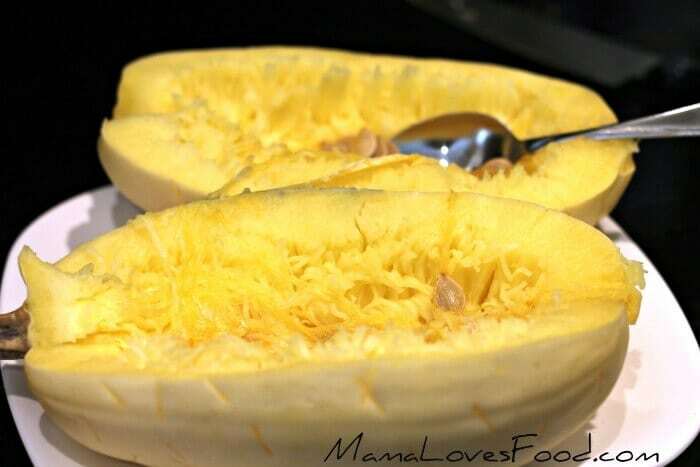 Microwave spaghetti squash is a great way to have a healthy lunch or dinner with no fuss. We love to make one of these in the morning and then set it aside for dinner later. Just cut it open when you’re ready to eat and create the ‘noodles’ by running for fork along the interior flesh of the spaghetti squash. 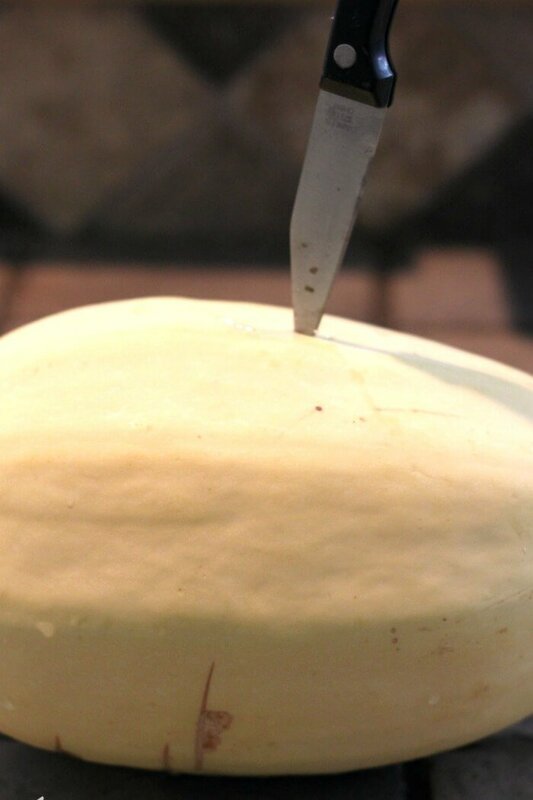 How long do you microwave a spaghetti squash to cut it? Microwave a spaghetti squash for about ten minutes before you cut it. If your spaghetti squash is larger than average, then add two more minutes to the cook time. The reason I like to microwave a whole spaghetti squash as opposed to halving it first, is because it is much easier to cut after it’s been microwaved. 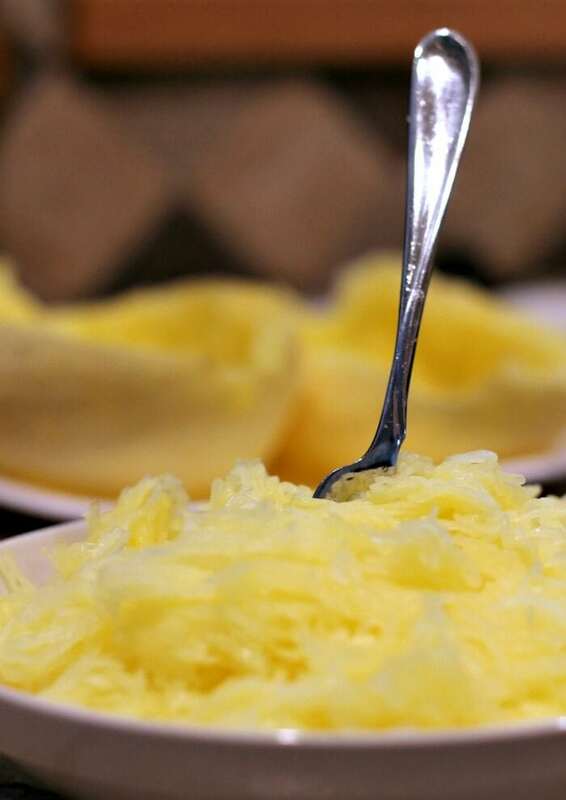 It takes several minutes in the microwave to soften the exterior of a spaghetti squash. Can you buy cooked spaghetti squash? 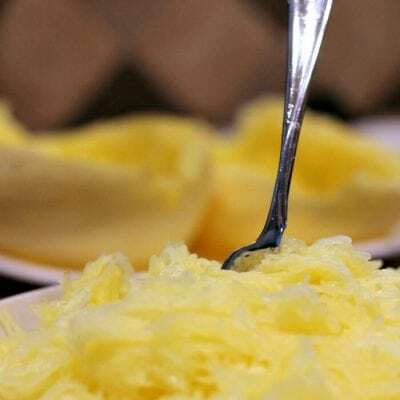 You can buy cooked spaghetti squash, but an uncooked spaghetti squash can stay good for weeks or longer if stored in a cool dry place, and since cooking a spaghetti squash in the microwave is so quick and easy, why not just do it yourself! How do you know when a spaghetti squash is bad? A spaghetti squash will last a long time if stored in a cool dry place – but they do eventually spoil. If the stem is black, moist or shriveled, the squash is beginning to rot. Julienne peeler – A handy little tool, perfect for making vegetable noodles out of almost anything! Stainless steel steaming basket – The perfect addition to your healthy eating repertoire – make everything from fish to broccoli! Yum! 5.6-Quart Capacity Colander – I love that this colander fits inside the pot and has a big handle. How convenient! Zucchini noodles – Another fun noodle alternative, these “zoodles” as the kids are calling them these days are a big hit in our house, even with the little ones! Cauliflower rice – This cauliflower rice is a favorite of mine with a simple Thai curry. Or just a little butter and soy sauce is delicious too! Spinach artichoke spaghetti squash – It’s like your favorite dip healthified! Marinara spaghetti squash – Going back to basics is always a great idea. What’s better than spaghetti and red sauce? Broccoli slaw – Skip the cabbage and grab the broccoli for this delicious twist on coleslaw! Spaghetti squash is a delicious vegetable that makes a wonderful noodle substitute - everyone should know how to microwave spaghetti squash! 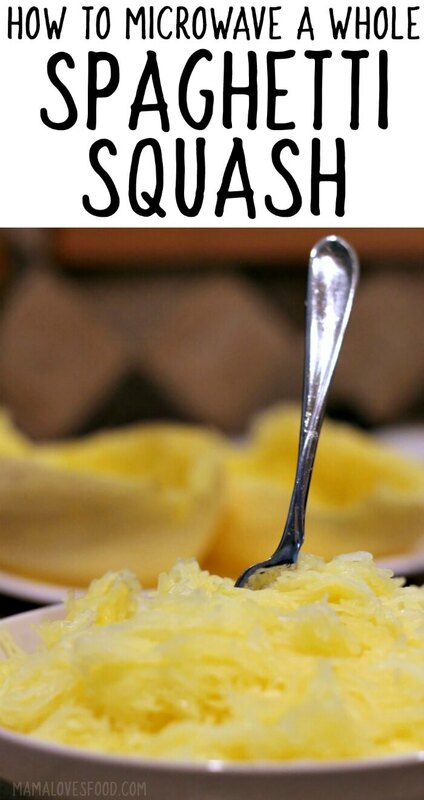 Rinse your squash and stab it a whole bunch of times with a paring knife or fork (much like you would if cooking a sweet potato). Go ahead, pretend it’s someone you can’t stand. Place on a microwave safe plate or dish and microwave at full power for 10 minutes (add an extra two minutes if it’s bigger than average). When you’re ready to eat, cut in half and scoop out the seeds. Then shred into ‘noodles’ with a fork and serve with your favorite sauce or even just a dollop of warm butter! Wow, that is easy! 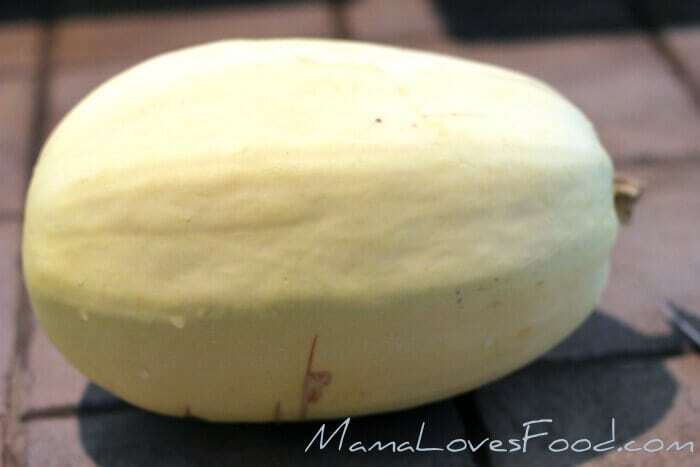 I have a spaghetti squash that's been sitting in my cupboard for about as long as yours… my hubby buys it but I'm not a fan of it so I don't often cook it. 🙂 Might have to try this! Thanks! love spaghetti squash!! I use the old fashioned ice pick to poke my holes -might try it – easier and less dangerous. That peeling is so thick! I have been doing this for a while. So much easier. First time I neglected to pierce it enough……it kind of exploded. I love spaghetti squash, it’s so good.